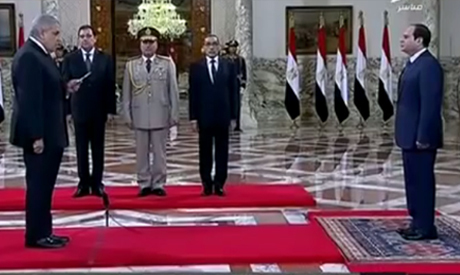 The first cabinet under Egypt's new President Abdel-Fattah El-Sisi was sworn in on Tuesday morning, headed by Prime Minister Ibrahim Mahlab. The new government -- the third since the ouster of Islamist president Mohamed Morsi in July of last year -- retains 21 existing ministers, one of whom will hold a new portfolio, and introduces 13 new ones. Headed by the president and the premier, the cabinet held its first meeting immediately after taking oath. Following the formation of the new Egyptian cabinet and some cabinet secretary enthusiasm and press release, I want to recommend some action items: 1- Implement performance evaluation at least once a year for all Egyptians working for the government. This performance review should include recommendations for future improvements/ projects/ individuals and teams. Road maps of what to be done in specifics. 2- Some ministries/ cabinets have been useless/ unneeded in the past so a careful evaluation of the mission and jobs in those ministries must be conducted. Examples include ministries of tourism, culture, labor, awareness (Eelam), Awqaf, etc. I will be talking about priority projects and needed action plans soon. You can read some of my writings on face book. EGYPY becom a very big joke all over the world .no one intreset in Egypt politic .because thousand peoples murdere come by force . Let's keep in mind that this government is temporary as well. After parliamentary elections, there might be, actually most probably, more changes. I see improvements with each change though, this time they are finally removing the ministry of information. Who told you that regime is like mubarak's regime? It's much worse. You can compare it with Kim Yong's military dictatorship.